Axis Bank offers premium financial services, internet banking, credit card, personal loan, travel card and fixed deposit account to its clients - personal and corporate banking services. With Axis bank mobile application, START BANKING A NEW WAY. YOUR WAY! Banking with Axis Bank is now just a touch away with the New Axis Mobile app – a simple, user-friendly, convenient and secure mobile application from Axis Bank. Note: You will be able to view and make payment to all your fund transfer beneficiaries registered on Axis Bank Internet Banking and vice-versa. 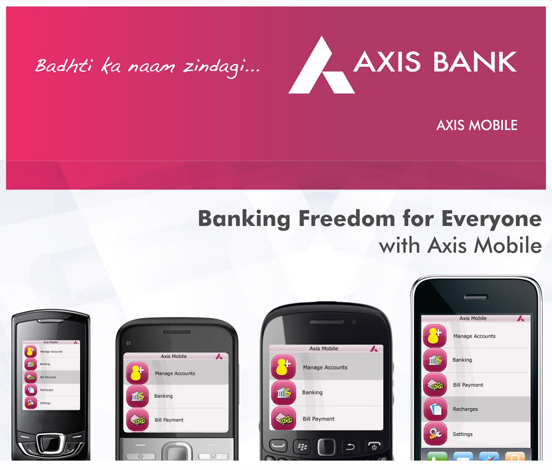 There are no charges for using Axis Mobile.